A gold future is a deal to trade gold in the future, with terms (amounts and prices) agreed upon now. With gold futures, you don’t pay (at least in full) until the future date at which the transaction is conducted, and the seller does not need to deliver the gold until this future date. This is known as the settlement day, and is typically – though not always – 3 months after the agreement is made. This delay allows gold traders to speculate on the price of gold. Investing in gold futures enables investors to trade in larger amounts than would be feasible if they had to settle trades as soon as they were agreed upon. 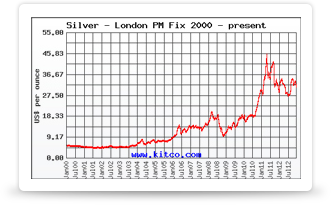 Gold futures typically require the payment of a margin. Similar to a downpayment, it prevents either party from walking away from the deal if the price of gold rises or falls between the agreement date and the settlement date. Usually held by an independent third party, this margin may be anywhere from 2% to 20% of the total value of gold being exchanged. If you have purchased a gold future and the price of gold begins to fall, you will be required to pay additional margin. Some investors prefer gold futures over immediate delivery because they provide leverage. Trading on margin allows for relatively small movements in the price of gold to translate into large financial gains. For example, if you have $5,000 to invest, you could purchase $5,000 worth of gold bullion with it. Or you could invest in approximately $100,000 of gold futures, because the margin on a $100,000 future would be about $5,000. If the price of gold goes up 10% during that time, you would make $500 if you held gold bullion, or $10,000 if you invest in gold futures. However, this also means that the corresponding risk is higher. If the price of gold falls 10%, you lose $500 with bullion, and your initial investment remains intact, enabling you to profit from future increases in the price of gold. The same 10% fall would cost you $10,000 with gold futures. Many people who trade gold futures end up losing money due to unpredicted and temporary drops in the price of gold. Gold futures are traded through a futures broker who is a member of a futures exchange. Most gold futures trading takes place with standard contracts in which the exchange specifies the settlement date, contract amount, and lot size. You can purchase several of these standard contracts to increase the size of your overall investment. Gold futures are dated instruments, which means that trading ceases before the settlement date. In most cases, traders will have sold the contract or bought back their shorts. Only a few investors deliberately run the contract to settlement, and actually plan to take delivery of the gold bullion. The majority of those investing in gold futures are looking to profit from changes in the price of gold, without any expectation of actually taking delivery of physical gold.